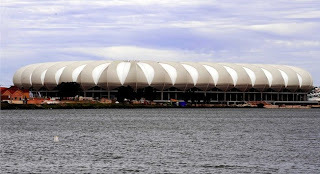 The Nelson Mandela Bay Stadium, set on the shores of the North End Lake is the first football dedicated stadium in the city or surrounding areas. The stadium, one of the newly-built stadiums for the 2010 FIFA World Cup™, was completed a year prior to the commencement of the world’s greatest show on earth – a major milestone for the city. The Nelson Mandela Bay Stadium will host the match for third place, and a quarter-final amid a total of eight matches during the FIFA World Cup. The stadium has an eye-catching, unique roof-structure and a spectacular view, overlooking the North End Lake. Before the construction of this multi-purpose venue, all international football matches were played at the Eastern Province rugby stadium, the EPRU Stadium. The playing field is natural grass with the outer / surrounding area to be artificial turf. One of its first major test events was the coveted Soweto Derby between Orlando Pirates and Kaizer Chiefs – a game that attracts capacity crowds in South Africa.